The breeze was chilly, but the sun was illuminating all the treasures. 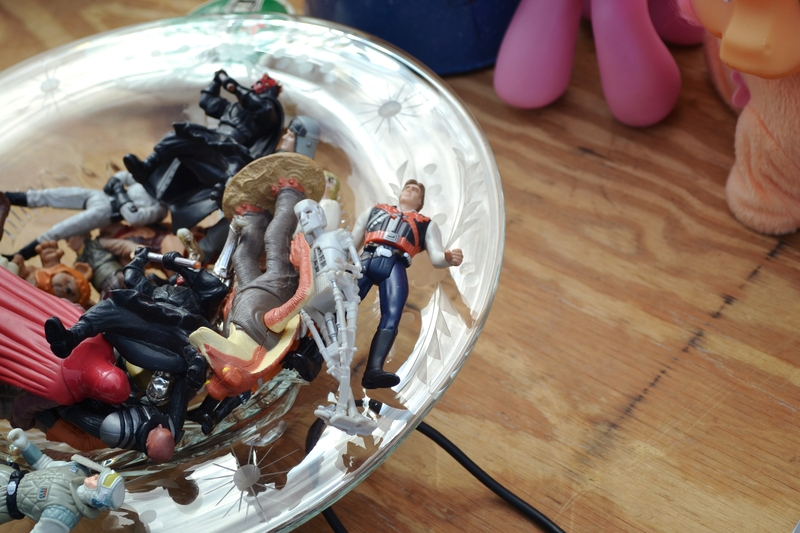 A bowl of Star Wars figurines sat on the table. Hands rummaged through them as if it were a candy bowl looking for their favorite flavor. There were tables of old tools, aged with laborious hours, toys of yesteryear, handcrafted jewelry, and ceramic knickknacks spread across the parking lot waiting to be reclaimed and re-purposed. 99.9 The Hawk, a local classic rock radio station, hosted its annual Spring Cleaning Yard Sale at the Steel Stacks this past weekend. Vendors paid $10.00 to reserve a spot and paid upon entry. The Hawk also offered vendors the opportunity to dispose of any merchandise that did not sell. At the end of the event, the host kept making announcements over the loudspeaker of the status of the dumpster – when it was full they would no longer accept any waste, forcing you to tote your unsold items home. 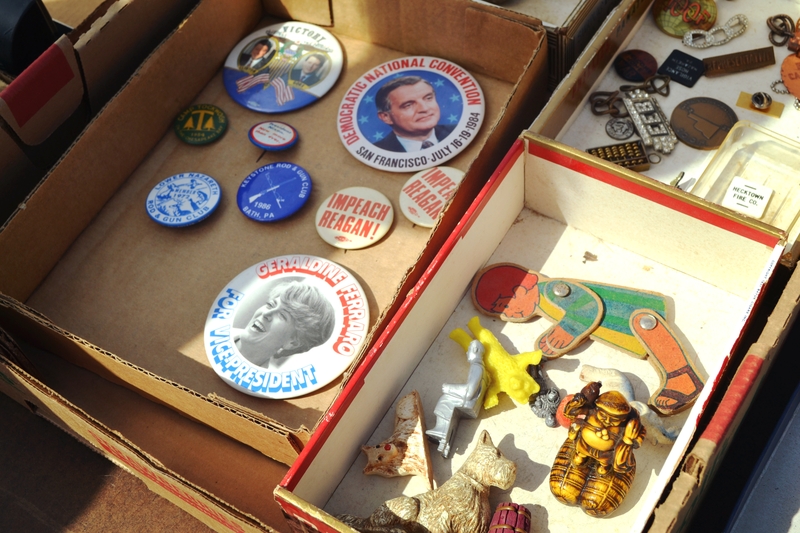 This year, the Spring Cleaning Yard Sale had over 250 vendors! One of these vendors was ArtsQuest. They hosted a table where they sold Musikfest mugs at a discounted rate from past years. It’s always a great idea to stock up on mugs if you live in Bethlehem so your guests can borrow them when visiting for the festival. 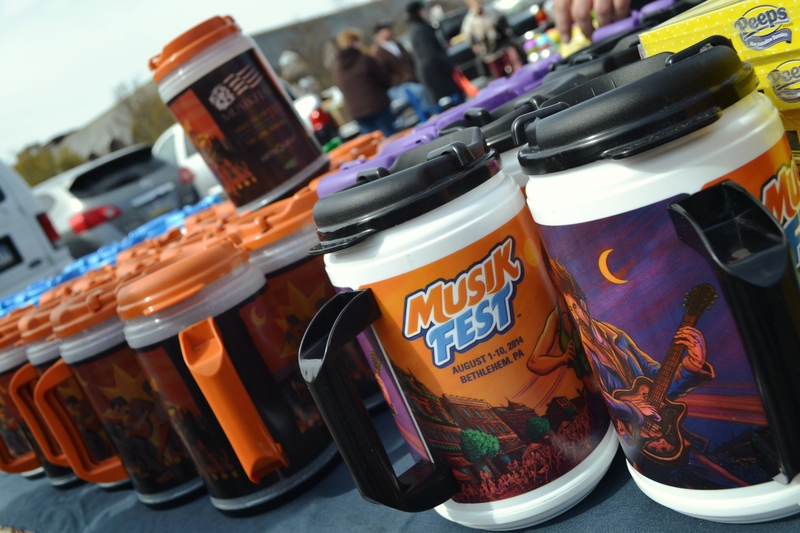 Not only do the mugs get you discounted drinks, but “The Mug” is so iconic to Musikfest that festing without toting one would not be the same. There were some vendors who really took the time to present their goods in the best light possible. The images below are from just one vendor’s table. They utilized the picket fence they were selling to adorn their table with character. Their presentation was one to be noted. Other vendors threw their goods in boxes to be rummaged through at your leisure. Some popular items this year were: ceramic beer steins, beanie babies, CDs/DVDs, and toys, lot and lots of toys. One con, which some may see as a pro to a yard sale, was the lack of salesmanship. Not a lot of vendors approached you trying to haggle while browsing. Haggling can be the funnest aspect of yard sales. Yet, without the salesman aggression, it proved a very relaxing morning to leisurely stroll through the vendor tables with a cup of coffee in hand. If you enjoy a good yard sale, the 2015 Fall Clearance Yard Sale, also held by 99.9 The Hawk is scheduled for Saturday, September 19, 2015! More information can be found on the Hawk’s website here.